district, hospitals are almost financially independent." "We have targets for each quarter, and we have to fulfil it to generate enough profits. There are regular meetings in the hospital. We discuss which medical department is not doing well in terms of meeting targets. We, doctors, all want to generate profits, and the hospital wants to generate more profits as well." The financial revenue performance targets are thus written into the doctors' contracts, with a financial bonus dependent on meeting those quotas. According to the doctors interviewed by Yang, a typical bonus for a junior doctor is around Y2500 quarter, for a doctor whose basic salary is 5000 a month. As well as receiving their hospital bonus for prescribing, doctors also receive kickbacks from pharmaceutical companies, based on their level of prescribing. Drugs have high profits margins for pharma companies - and some of this is passed on to the prescribers. "The profit for the pharmaceutical company is around 5-15% of the wholesale price, and 10-30% for the hospital." - pharma industry manager. This is where it gets interesting. According to Yang, the pharma companies have promotional budgets that they disburse to hospital in the form of bribes (incentive payments/commissions) to the doctors - but more importantly to the hospital pharmacy committee. This committee, which includes the director of the pharmacy department, the vice hospital president, directors from various medical departments, and some other specialists, decides which drugs are purchased and used by the hospital. medicines need a lot of money to get listed in a hospital, especially for Chinese medicines." Once a hospital has agreed to stock the drug, the pharma company must then target individual doctors with offers of commissions to prescribe their particular drug. Doctors may be offered a commission of 15-20% of the drug price. This encourages doctors to prescribe the most expensive drugs and for long periods. Sometimes doctors are paid indirectly, with the drug company paying them 'lecture fees' or 'travel fees'. " "Sometimes, a doctor does not need to give a lecture. We issue a receipt under a title of ‘fees or academic lectures’. We will transfer the money to the doctor as a way to pay for drug remunerations. This way, everything is legal." " Drug remunerations are paid monthly based on how much the doctor prescribes. In Shanghai, a doctor work in outpatient clinics in a Class III hospital can earn up to 50,000RMB a month from pharmaceutical companies," said one pharmaceutical representative. "The most widely used medicine in my company is X. It could be used on a lot of diseases, for recovery. 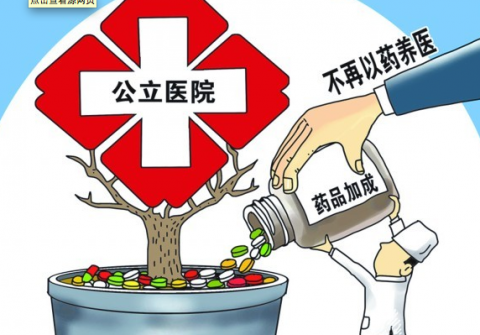 Drug remuneration is around 20% of the retail price…You may not need it, but anyway, it will not kill you (so doctors will prescribe it)…"
In the concluding remarks, Yang Wei notes that the Chinese government is now trying to move away from the commission system for drugs in hospitals. It has encouraged 'zero markup' policies for hospital pharmacies and has also introduced lowest price tenders to ensure that inexpensive drugs get first priority. However, Yang notes that faced with the need to generate revenue, hospitals simply sidestep these reforms by creative accounting and supply deals in collusion with the pharma companies. And when barred from generating income from drug sales, hospital simply switch to profiteering from other services such as medical devices such as cardiac stents (Y2000 each) - or offering unnecessary checkups and tests. happening now, and the healthcare costs will continue increase and remain high ... In order to follow the policy and to keep the profit of the hospital, hospitals may promote use of high-tech diagnostic procedures, special wards and other methods to increase non-pharmaceutical expense…"
Yang concludes that the problem of overprescribing and/or overservicing will remain until the Chinese central government and the Ministry of Health solves the problem of adequate resourcing for hospitals. Local governments have no incentive to enforce curbs on their local hospital revenue - and the central government has little enforcement clout at the local government level.